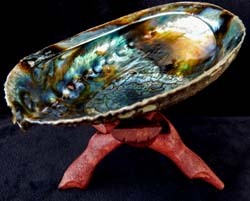 Abalone Shell - Shells are perfect for burning Sage and Wands, add some sand and it can also be used for sticks and cones. Not recommended for CHARCOAL tablets. This beautiful blue shell is approx 5" to 6" in size. Cobra Stand NOT included ($5.99 each). Please add stand as a separate purchase. Recommended to use sand in shell to protect from heat.